Back cover blurb: Two women – desperate to unlock the truth. How far will they go to lay the past to rest? ANNA has been taught that virtue is the path to God. But on her eighteenth birthday she defies her Mamma’s rules and visits Florida’s biggest theme park. She has never been allowed to go – so why, when she arrives, does everything seem so familiar? And is there a connection to the mysterious letter she receives on the same day? ROSIE has grown up in the shadow of the missing sister she barely remembers, her family fractured by years of searching without leads. Now, on the fifteenth anniversary of her sister’s disappearance, the media circus resumes in full flow, and Rosie vows to uncover the truth. But will she find the answer before it tears her family apart? 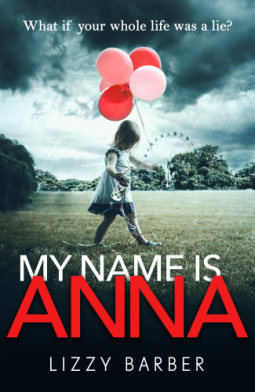 My Name is Anna is a novel that will grip you from its first pages; where you meet Anna, quietly frightened of her own Mother, known as Mamma, a fanatically clean, overly religious and quietly controlling woman. On her Eighteenth birthday, Anna defies her Mother and visits Florida’s biggest and most popular theme park, Astroland with her boyfriend William. She knows that she has never been there before, for her Mother has forbidden it. In the U.K., Rosie has grown up in the shadow of her missing older sister, Emily. The sister she can barely remember, but is forced to celebrate every anniversary in the media spotlight with her family in the hope that it will unearth a new piece of evidence that will bring her missing sister home. Rosie more than ever wishes that she could help to find her sister, as she knows that it is the only thing that will keep her fragile family from falling apart at the seams. My Name is Anna deals with some difficult subjects brilliantly, and really makes you care about its characters. I know it's only January, but I truly think that this will be one of my favourites for 2019! My Name is Anna is available from 10 January.